According to Variety, The CW has released trailers and first-look featurettes for the network’s upcoming new series Frequency and No Tomorrow. The CW also released promotional material for Supergirl, which is flying on over from CBS. 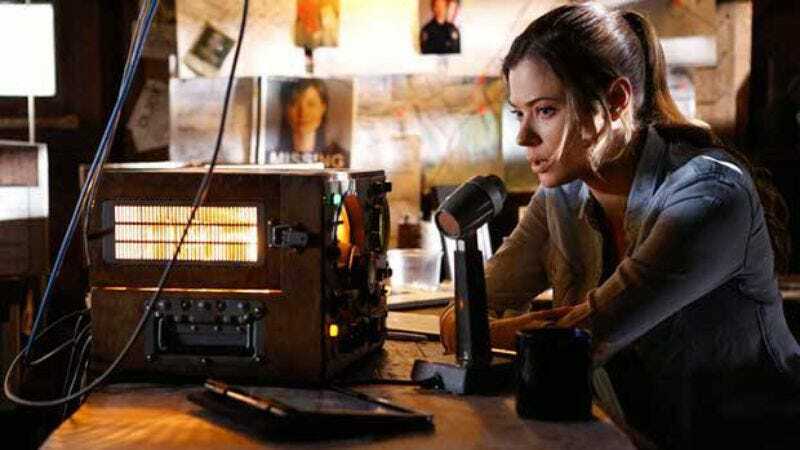 Frequency, based on the Dennis Quaid-starring film of the same name, tells the story of Detective Raimy Sullivan (Peyton List), who is mysteriously contacted by her dead father (Riley Smith) over his old radio. It turns out he’s transmitting over the airwaves from 1996, in the days leading up to the hit that took his life. Luckily, his daughter in the future has the knowledge to help him survive this time around. But as they embark on a father-daughter mission to rewrite history, they realize that every change could lead to dire consequences. Eventually, Raimy ends up with two sets of memories: The timeline in which her dad was murdered and the timeline in which he wasn’t. (Why does anyone ever think changing the past will be simple?) The trailer has a wonderfully old-school sequence of lightning hitting Raimy’s antenna and bringing the old radio to life, while the first-look video introduces some of the other characters in the story, like little Raimy—who talks to her future self over the mystical radio—and Raimi’s mom Julie (Devin Kelley). On a slightly lighter note, No Tomorrow is a jaunty romantic comedy about the end of the world. Evie Callahan (Tori Anderson) is a quality-control assessor who makes lists for everything and lives a very calculated life. Then she has a meet-cute with Xavier Holliday (Joshua Sasse) at the farmer’s market, and he encourages her to live a little more freely—because he thinks the planet is going to be destroyed by an asteroid in eight months. Xavier lets Evie in on this little tidbit of information and convinces her to join him in some of the activities from his Apocalyst. which includes everything he wants to do before the end of the world. Even though she thinks he’s a little crazy, Evie ends up making an Apocalyst of her own. No Tomorrow is based on a Brazilian format and seems to perfectly fit in with other unconventional romcoms on The CW, like Jane The Virgin and Crazy Ex-Girlfriend. No Tomorrow also stars Amy Pietz, Sarayu Blue, and Jonathan Langdon. Meanwhile, promotional videos for the new CW-fied Supergirl highlight the other superheroes of the network, with footage from Arrow, The Flash, and Legends Of Tomorrow. It’s the multiverse that keeps on giving. The CW will release a trailer for the new Greg Berlanti series Riverdale, based on characters from Archie Comics, at a later date.